The Westalee Block of the Month is going to be postponed until later in the year. Instead, beginning March 14, Michelle will begin a different, smaller project. This will use Sampler Set 1, which many of you have already purchased, and the 12” arc ruler that is used in the Basic Ruler Work class. It is a quilt-as-you go project, and the last class will be spent learning how to assemble it – quick and easy! We will post a picture on line as soon as Michelle completes her sample. Later in the month, Michelle is teaching beginning free motion quilting (without rulers) Thursday, February 22, and Judy Bowers will have a Judy Niemeyer Sew Day Tuesday, February 27. Last, but not least, we will have our monthly Sew Day Pot Luck Saturday, February 17. We had a ton of fun last month – lots of great food, good company and fun working on our projects. The theme this month is Soup/Salad, so we will have lots of good food again. Plan to join us if you can! Amy and Sharon are in Chicago this week attending Software Infusion training. They will be returning home with lots of new information to share about Bernina’s Software packages that can be used by most popular brands of machines. The shop will begin selling and doing Mastery Classes on the Embroidery Software to enable our embroidery enthusiasts to broaden their horizons. 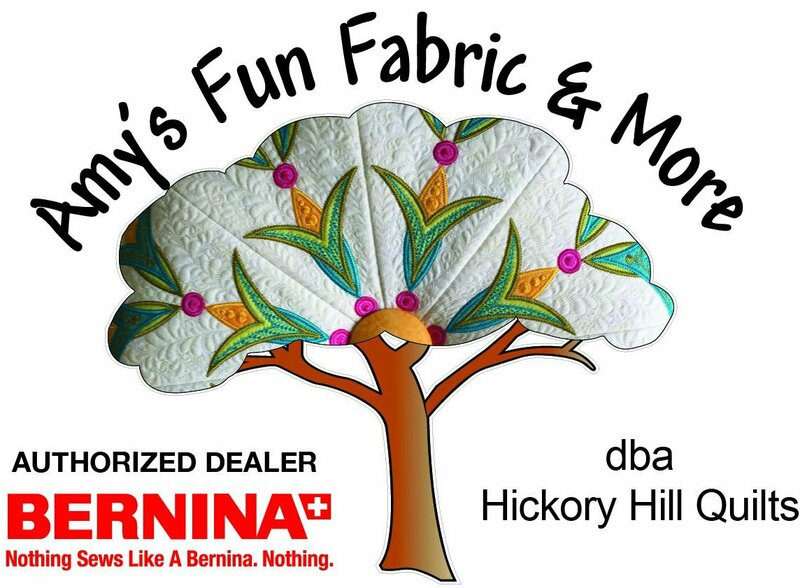 NEW: April 11th Hickory Hill will host Bernina Consumer Software Training - Broaden Your Horizons with Bernina Software! Sign up on line. Perhaps you have embroidered for a while and now wonder what’s next. Perhaps you own software, but you are not sure what to do with it. Perhaps you are just starting to embroider and are curious about what software can do for you. Come to the class to learn about what BERNINA Embroidery Software 8 can do. Bring your computer with the software installed, power cord, and external mouse to participate in a software hands-on class to show you some of the wonderful things software can do for you. It is set up and ready for on line sign-up. The Shop in Shop is in and we are so excited for everyone to visit and let us know what you think! Lots of new fabric is being received daily. For you Grunge enthusiasts - Dots Are Here! Look at our on line sales section under fabric to see all the new colors! hhqsewingcenter.com has all the latest classes & information! Come see us at Hickory Hill Quilts! Call 501-318-2739 if we can answer any questions!